Dental disease is the most common problem I see in dogs and cats. During physical examination, I look for large accumulations of tartar, inflammation of the gums, masses, fractured teeth and other problems. 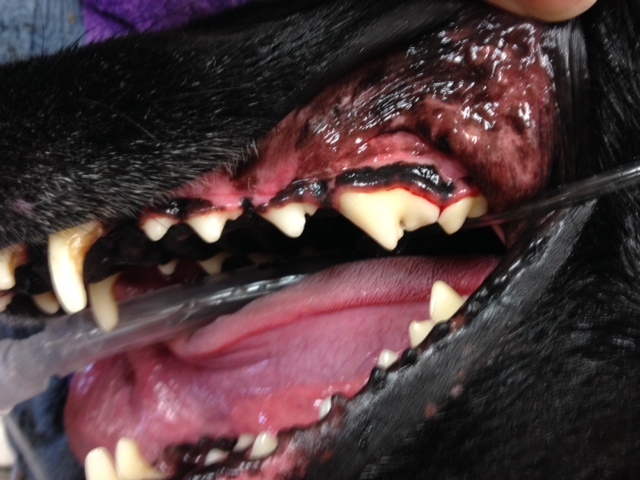 Pictured below is the mouth of a dog before having a complete oral examination including dental X-rays and treatment. See the severe accumulation of tartar on the upper premolar and molar? The tip of the large canine tooth as well as the back surface is worn creating a large defect in the enamel. Now look on the inside of the teeth on the other side of the jaw. The premolars and molars located on the right side of the picture are stained and covered with tartar. 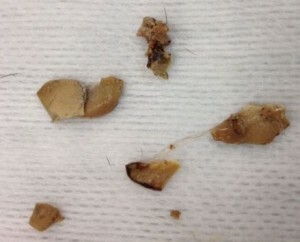 Then an ultrasonic scaler was used to remove smaller pieces of tarter. The tip must be kept moving at all times to prevent damage to the enamel surface of each tooth. After the crowns (exposed surface of each tooth) is cleaned, the area below the gums are scaled by hand to remove calculus and infection. In my opinion, if this step is not performed, the dental is worthless. The last step in the dental is polishing all the surfaces and treating all problems that were found. 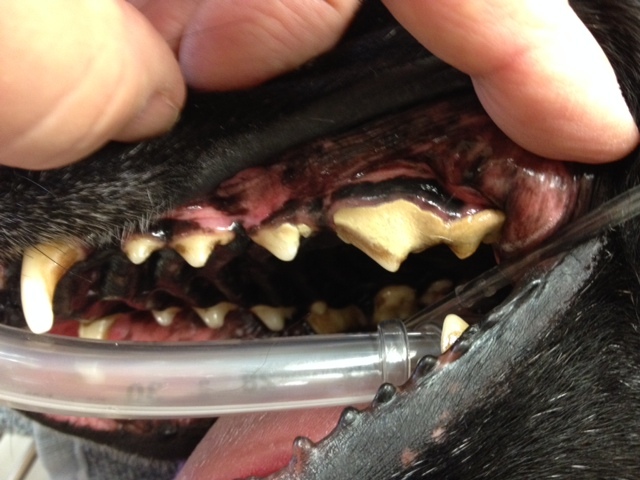 This dog has periodontal pockets of infection that were cleaned, polished and packed with an antibiotic gel. In this ‘after’ picture, note the bleeding along the gum line of the premolar and molar. The tartar extended under the gums causing severe inflammation and infection. The damage gums bleeds after treatment but will heal if kept clean. If the area under the gums had not been cleaned, the infection would have spread up the root. The dog would have been in extreme pain until the tooth was removed. That is why I consider anesthesia-free dentals malpractice. Cleaning the crowns make the teeth look good but does nothing for the areas under the gums – the roots. Also, without anesthesia it is very difficult to clean the inside surfaces of the crowns and polish. I have seen an image of a cat who had their tongue almost ripped-off during an anesthesia-free dental. The damage was so severe that the cat couldn’t eat and was euthanized.